Yesterday, I spent most of the day offline at the Wisdom 2.0 Conference where I gave my full attention to the presentations and conversation. The Wisdom 2.0 Conference is a one-of-a-kind event in Silicon Valley that brings together an unusual mix of technology leaders, Zen teachers, neuroscientists, and academics, to explore how we can live with deeper meaning and wisdom in our technology-rich age. The conference was created by Soren Gordhamer in 2010, author of the book, Wisdom 2.0. I attended the first conference in May, 2010 was filled with gratitude to Soren for the amazing experience and opportunity to reflect life and balance in age of social networks. This year, I was honored to be speaking on a conversational panel about Wisdom and Social Good, Giving, and Technology along with Laura Arrillaga-Adreeessen, author of Giving 2.0 and Premal Shah of Kiva.Org. This summarizes some ideas and takeaways from my day. You know a conference is going to be a different experience when you walk into the conference area and there is harpist playing beautiful meditative music that melts away as the chimes and bells ring to signal the beginning of the conference. Soren welcomed everyone and asked to be totally present and give full attention – which is becoming rarer and rarer at conferences. I decided to have a different experience than live tweeting and even taking notes on my laptop. I use pen and a note book to take notes! This post shares some reflections from yesterday and a few nuggets that I learned from the presentations. One of the questions that threaded into each conversation or presentation was, “What is important for creating a wisdom-based culture?” I don’t have an answer, but I think it has to do with modeling conscious information and consumption and being mindful about how you connect with people, cultivate relationships, and share information. I couldn’t help but think about how important content curation skills, information literacy, and encouraging a movement around this as Clay Johnson suggests in his book, the Information Diet. I also talked about this from the perspective of nonprofits putting social media into practice. I call it slow social media .. a slowing down, making mindful choices about what channels are truly effective and slowing down and being intentional about practice – so good practice becomes a habit. There was applause from the audience. I also have to say that this isn’t a black and white approach. Howard Rheingold, in his steps for building your network on Twitter, includes the step of “exploration” which is an invitation to serendipitous encounter. So, the point is that there is intention and mindfulness when you choose to explore. In our panel discussion, Laura was asked about being mindful in our philanthropy and giving. She talked about how to be strategic and also emphasized taking a curated approach to giving. Not just reactive giving, but being more strategic – giving to where your personal passion lies – and to research the organizations so you know you’re giving to organizations that highly effective at what they do. She also stressed that this philosophy is as important for giving gifts of $10 as it is for $10 million. Soren asked a terrific question about how technology and being connected helps or gets in the way of giving. Permal Shah of Kiva.Org talked about the importance of linking with stories and building bridge between the donor and the results. Permal’s comment made me think about some of my first experiments in social fundraising, where I raised money for the Sharing Foundation to send a young Cambodian woman, Leng S. to college using my blog and later Twitter. I reached out to my network to ask for support, but using stories about her – not dry organizational stats. Leng Sopharath has graduated, has a job, and now we’re even connected on Facebook where I learned she also got married. When I shared the photo with my network, I received comments from people who had supported my fundraisers over the years — comments that made me think that everyone felt good about being able to make a small donation and really change someone’s life. Kiva does this in way that scales and they are a highly effective organization. Jack Kornfield, a buddhist teacher, gave a talk about “The Case for Wisdom in the Modern World.” He started off with a great story about what a tribe in South Africa does when someone in their community does something bad. Everyone in the tribe meets with that person to tell them of all the good deeds they’ve done in there life as a part of several days of celebration. Then the person is welcomed back into the tribe. He shared this story and someone came up to him and said he was from that area and said, “I’m not sure they actually do that, but I will email them the description and ask them to try it.” His story was of about the speed and influence of modern connections. He also talked about how self-organizing networks (think Occupy) form as a sort of immune system response because there is something missing. He talked about how wisdom is being able to manage budha and your mobile device. The benefit of wisdom is freedom of your spirit. He also warned that wisdom is not self-improvement, but more a sense of inner strength and knowing what matters. Most importantly, wisdom brings trust, community, stewardship, and creativity. Lee Rainie from the Pew Research Center, gave a talk and shared some stats on “Our Digital Life: What the Research Shows.” The data covered the good, bad, and the ugly of our digital lifestyles. 61% had experiences that made them feel closer to another person. (Many said they had both experiences. Dr. Dan Siegel, a brain researcher, gave a riveting talk about interpersonal neurobiology – and what goes on in our brains and how it impacts our offline researches when we spend too much time connecting online. It was based on his forthcoming second edition of his book, The Developing Mind. He gave the talk in easy to understand terms, although pointing out that there was years of research to back up what he was sharing. My takeaway again was the importance of having that “Time In” time where we quietly reflect internally, focusing on sensations, images, feelings and thoughts, we help to better integrate the brain. His framework above, “The Healthy Mind Platter” describes the balance of different brain activities you need to incorporate into your life to be balanced. You can read more about the concept on his site and find links to his books. There was a wonderful interview with Jane McGonigal and Kelly McGonigal about their work. I didn’t realize this, but they are twin sisters. Jack Kornfield, also a twin, did the interview. There were two things that I heard, one from each sister, that surprised or resonated. Jane mentioned that the gamer community we works with are compassionate and want to be engaged in service in the real world – not the typical stereo type of a gamer. 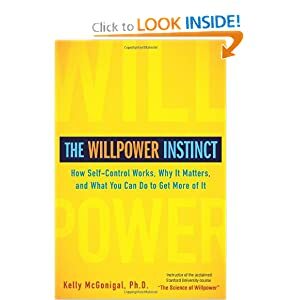 Kelly, who has just published the above book on Willpower, talked about her own difficulty learning to say no. She said there is panic and fear in saying no (and in saying yes). The panic for no is familiar one for me – the panic of letting people down and then the panic of saying yes to something that you should not have said yes to. She also said that there is a similar panic in saying yes to something that is right, but the panic of rising to meet the challenge is scary. I got a copy of the book. It is designed so you put into the practice some of the ideas about exercising will power – the ability to control your attention, emotions, desires and influences on your physical health, financial security, relationships, and professional success. It is a book about changing behavior – whether a new diet plan or learning to focus on what matters at work and in life and get it done. Its written by a scientist so you get a chance to experiment with the techniques. These ideas and skills – are important to living in an age of unlimited connections, choices, and information – and that’s why it caught my eye. Thanks for sharing, Beth! Having been so immersed in the live, tech-mediated note-taking for the past several years, how did it feel to be going back to the ol’ notebook and pen again, and posting reflections afterward rather than in real-time? Would you do it again? So timely! I have been feeling “guilty” that as a previous twitter evangelist (in my little world) I have been completely abstinent for awhile because I haven’t figured out how to be balanced in my management of my twitter time. Thanks for providing some details…enough to get a sense of each speaker’s thesis and then links to the resources. To your questions: online professional networks & off-line yoga! Eugene: What a great question! First, I opened up my laptop and was going to tweet and storify – and the tech immersed note taking. But I was sitting in a section with other speakers – with Buddhist teachers and the “Happy Fellow” from Google. They were not on their devices. so, I felt a funny peer pressure not to do use it. Also, Soren has asked us to be presence ..
Then came the fear. OMG, will I be able to write a decent blog post. Will I remember anything? In the last six months, I have been gradually coming back to drawing and hand writing stuff because it grounds me. I realized after hearing about the brain research, how important this is. So, today, I was able to write a decent post based on the handwritten notes I took. Also, because I decided not to do the tech immersed multi-tasking thing, I was to give my attention to the information and be present – vs being distracted. Hope that sounds clear – and thank you asking for such a great question. If you haven’t read it yet, read Peter Bregman’s 18 minutes book – it was a big game changer for me. How do you manage Buddha and your mobile device? Beth: I turn off my iPhone while practicing yoga! I am struck by the challenge of finding the balance. I like to be focused and purposeful, but enjoy Howard Rheingold’s validation of exploration to allow for serendipity. Right now I am trying to be less on task, more wandering to discover new realms. Stephanie: Yes, it is all about the balance – isn’t it? How does having more serendipity in your life feel? This is awesome content Beth. I can’t wait to dig into it more. I was really struck by your resolution to stop consuming online french fries mindlessly (also like Seth’s firehose metaphor, but the addictive nature of the pommes frites really speaks to what’s happening to many of us). Thanks! Beth, Thank you for this comprehensive and thought-provoking article. I wanted to respond to your last question and share two authors I read to help me reflect on anything and everything about life – A.C Grayling and Alain de Botton. You could call them both modern philosophers – they write stuff that wakes up your brain. I will definitely check out A.C. Grayling – any specific recommendations or pointers to his work to read first? @Claire — so much can be addicting because it gives our brains dopamine. The first step is becoming aware of it and making change. Wonderful post Beth! The balance issue is more than understanding that the device is a tool, and not an End unto itself. It’s about finding the balance between device and all the other tools we’ve developed. And not merely the device vs. the other tools, but the device in synergy with the other tools.